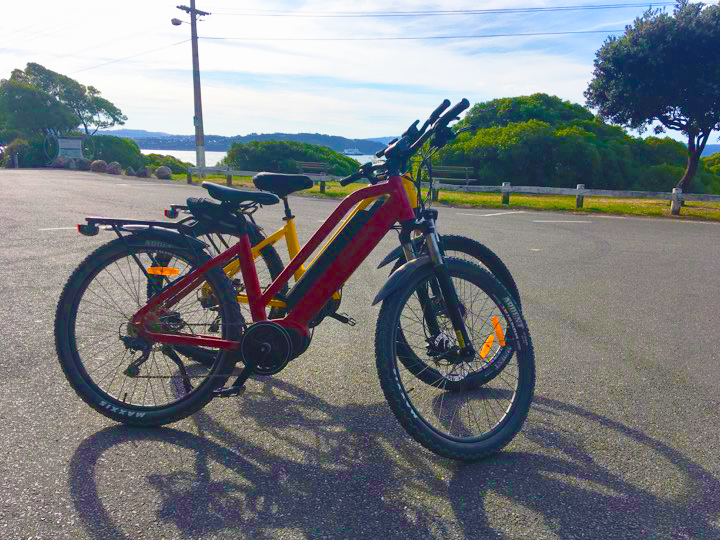 Our fleet of "Hikobike Ranglers", have the largest batteries on the trail, powerful motors, rugged + reliable mountain bike components (and comfortable gel seats! ), all on a user-friendly step-thru frame. The best eBikes, at the best price - give them a go, you won't regret it! Great for those getting back into biking after fitness or injury issues. Hydraulic disc brakes with large rotors | Reliable, powerful, stop in a hurry if you need to. 10 speed drivetrain with 5 power assist levels | Essentially 50 speed - never get caught "between gears"! Quality Front suspension | Smooths out the rough bits. Seatpost suspension and gel seat | Best for your bum! High powered front and rear lights | Useful for Rimutaka tunnels or night-riding. Rear carrier rack | Lightweight and sturdy, allows you to transport essentials without carrying them on your back. Quality lightweight helmet | Safe, comfortable. Repair kit | Be prepared! Spare tube, pump, essential tools and step by step instructions in case of puncture. Pannier bags | Either large-volume waterproof panniers, or a sleeker lightweight version depending on the forecast. Fits to the rear carrier rack so you can save money on bag transfers. How and where do I pick the bike(s) up before my ride? There's three usual options, but let us know if these don't suit and we can figure something out! Petone Wharf | Right at the start point of the official Remutaka Cycle Trail. Just jump on a bus or train from Wellington and get off at the Petone Station, then walk about 200m to the wharf. We'll meet you there with the bikes all ready to go. Days Bay Wharf | The usual start point if riding the entire loop trail (highly recommended, and how the trail was initially intended to be ridden!). Take the East by West ferry from Wellington CBD straight across to Days Bay. We'll meet you there with the bikes all ready to go. Home Delivery | Want to make an early start, or just keep things flexible? We'll drop the bikes to you the night before your ride ($15 delivery fee per bike). What do I do with the bike(s) after my ride? If finishing at Orongorongo | Take our shuttle back to town, and we'll collect the bikes at the same time. Or, if finding your own way back to Wellington, just drop them to our base at Days Bay.on your way through. If finishing at Days Bay | Easy - just drop the bikes off to our base right next to the wharf! If biking the whole way back home | We'll pick the bikes up the night after your ride ($15 pickup fee per bike).